Frittatas are an easy way to incorporate more protein and vegetables into your breakfast, lunch, or dinner! Frittatas are very versatile, so feel free to swap in vegetables and ingredients you have on hand. In this recipe, we added bell peppers and kale. These frittatas are prepared in a muffin tin, making them easy to store in the fridge or freezer for a later time. Preheat oven to 375 degrees Fahrenheit. Spray muffin tins with nonstick spray and set aside. Heat oil in a medium skillet over medium-high heat. Add garlic, onion, and peppers and sauté until soft, about 5 minutes. Add kale and cook until wilted. Remove from heat. While veggies are cooking, in a large bowl, whisk together eggs, milk, cheese, salt, and pepper. Once vegetables are done cooking, add them to the egg mixture. Pour egg mixture into muffin cups, filling each about 1/2 to 3/4 of the way full. Bake in the oven for 10-12 minutes until puffed and golden brown. Cool in the muffin tin for about 5 minutes. 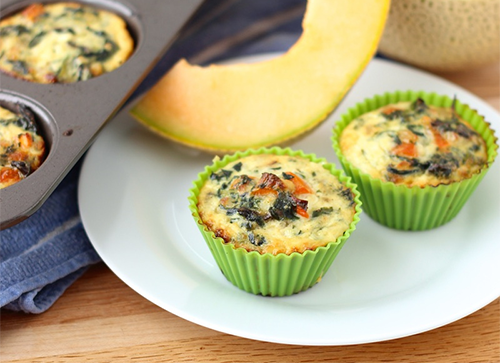 Remove from muffin tin and serve! * Can cool for longer and store in the refrigerator or freezer for later.